Belowground carbon (C) inputs are a major source of soil organic carbon (SOC) in terrestrial ecosystems, and substrate C:N ratios drive SOC stabilisation. In perennial systems, quantitative information on seasonal dynamics of belowground biomass is scarce, but necessary, e.g. to improve SOC modelling and representative sampling. Seasonal dynamics and depth distribution of belowground biomass C and N of extensive grassland and Miscanthus on sandy soil were estimated. Core samples (1 m depth) were taken six times in 1 year. Miscanthus-derived SOC was quantified using 13C natural abundance. Grassland and Miscanthus differed strongly in belowground biomass C (2.5 ± 0.3 vs. 7.3 ± 1.1 Mg ha−1) and C:N ratios (28.6 ± 0.5 vs. 60 ± 3.3). Peak grassland belowground biomass C and N stocks occurred in summer, while those of rhizomatous Miscanthus were in winter due to different strategies of resource allocation. Grassland roots showed a strong seasonal pattern of C:N ratios, indicating N remobilisation. 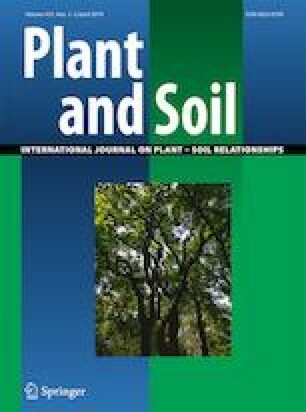 Miscanthus-derived topsoil SOC was low relative to the high belowground biomass, indicating a slow transfer of rhizome carbon to bulk SOC. Representative belowground biomass sampling of perennials should take seasonal dynamics into account, especially in system comparisons. Furthermore, C inputs from rhizome and roots should be estimated separately owing to likely differences in turnover times. The online version of this article ( https://doi.org/10.1007/s11104-019-04074-1) contains supplementary material, which is available to authorized users. This study was financed by the German Federal Ministry of Food and Agriculture as part of the German Agricultural Soil Inventory. We thank Anja Müller for her endurance in root washing and students of the technical university of Braunschweig for measuring basic soil parameters.